The following guest post was voted best in the class for an undergraduate assignment on communicating science from Humboldt State University’s Fall 2018 Fish Conservation and Management course taught by Dr. Andre Buchheister. 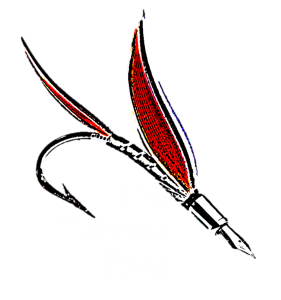 The assignment required students to find a peer-reviewed article on a fisheries management topic that interests them and to communicate the issue in a blog format to a general audience. In the frigid coasts and rivers of southern South America and the Pacific Northwest in North America swims the Chinook Salmon (Oncorhynchus tshawytscha). Inhabiting the entire Pacific Northwest spanning from California to Alaska, these fish are known as a top-rated sportfish and a commercially valuable catch, and they are regarded as a sacred fish by the native peoples whose lives are intertwined with this species. The author with a Chinook Salmon caught off of the coast of California. As a non-native species in South America, people’s attitudes towards Chinook Salmon are mixed given the varied ecological and economic effects they are having in the region. In recent years, this area has started to be known worldwide as a premier, trophy Chinook Salmon destination for recreational sport anglers. However, scientists have also documented and projected ecological and economic consequences which makes this a sticky situation because of the potential economic benefits the non-indigenous species could offer on top of being an ecological invader. Chinook Salmon were introduced to South America in 1977 in a small stream on Chiloé Island in Chile where approximately 1.5 million small Chinook were released. In the following decade, the salmon were intentionally introduced to the Magellan region for ocean ranching operations (Correa and Gross 2008). Ocean ranching is a type of aquaculture in which juvenile fish are put into net pens in the ocean where they are fed and grown until being harvested later (Arnason 2001). Additionally, in the 1990s, Chinook Salmon escaped from aquaculture facilities, which contributed to the growing colonization of the rivers throughout southern South America (Correa and Gross 2008). In the following years after these introductions, a rapid colonization and establishment of salmon throughout these river systems was observed (Correa and Gross 2008). The observed range of Chinook Salmon in South America (black areas) over different time periods. The hatched area is the predicted range from a study done in 2008 (Figure from Correa and Gross 2008). In their non-native habitat in Argentina and Chile, these fish go through the same life history process as the Chinook Salmon do in the Pacific Northwest. Chinook Salmon have evolved to spend their first stage of life in the comfort of rivers, spending anywhere from 3 months to 3 years in freshwater (Morrow 1980). After their freshwater stage, they leave the rivers to typically spend up to 4 years in the ocean, bulking up for the spawning run in which they travel up to 4827 km (2999 miles) upriver to spawn (Browning 1980). Chinook Salmon only reproduce once and die in the rivers where they spawned. The presence of non-native Chinook Salmon (and the speed in which they have colonized), can cause several consequences in the river and marine ecosystems of South America . As a new predator, the salmon can create an imbalance in the existing food webs in Southern South America. In freshwater, the salmon can compete with native fishes for prey resources, although they may serve as food for piscivores as well (Correa and Gross 2008). In marine waters, salmon are consuming a number of different fishes, including populations of commercially sought after species such as the Southern Hake (Merluccius australis) and the Blue Grenadier (Macruronus novaezelandiae). After dying from spawning in rivers, the Chinook carcasses are also contributing an excess of marine-derived nutrients in the water (Soto et al. 2007). In South America, there are no natural scavengers of Salmon carcasses as in North America where bears, raptors, and other animals have evolved to remove them; consequently, some rivers see an excess of certain nutrients (particularly phosphorus) that could set an imbalance in the water system (Arismendi et al. 2007). Excess phosphorus can lead to toxic algae blooms which may result in fish kills. Furthermore, the mariculture of non-indigenous species such as Chinook Salmon can be a gateway for introduced and exotic marine species (Castilla et al. 2005). Salmon that escape from aquaculture facilities may carry parasites and pathogens that can spread throughout the marine systems (Sepúlveda et al. 2004). Unfortunately, the invasion of Chinook in Chile is also coinciding with colonizations by non-native algae and macroinvertebrates which are adding to the ecological stress to the native food web (Correa and Gross 2008). From the varied perspectives of humans, the issue of the Chinook Salmon in Chile is complicated. The introduction of Chinook Salmon has the potential to create valuable recreational and commercial fisheries for this species in the ocean and rivers, as they have in the Pacific Northwest (Correa and Gross 2008). Currently, there are already growing recreational sport fisheries present in the rivers, which have provided benefits in economic and recreational aspects (Correa and Gross 2008). If a commercial fishery were to be introduced for these fish, it could provide a source of employment for rural areas in both Chile and Argentina. However, on the other side of the issue, Chinook Salmon may be eating commercially fished species such as the Southern Hake (Merluccius australis) and the Blue Grenadier (Macruronus novaezelandiae) before they are caught, leading to revenue losses for fisherman (Correa and Gross 2008). Going forward the stakeholders must adapt and make management plans that address the issues caused by the Chinook Salmon, but they will also need to address how it could be utilized as a commercial sportfish (Correa and Gross 2008). Humboldt State University student, Charles Ricci, with a recreationally-caught Chinook Salmon in California. Recreational anglers in Chile also enjoy catching this beautiful fish. In South America, the ecological and socioeconomic effects of the Chinook Salmon invasion have not been studied thoroughly. However, there have been several genetic studies looking at traits, ancestry, and mating structure conducted on the salmon populations concerning where they originated (Correa and Moran 2017). These studies help us understand how the Chinook Salmon is adapting to its new environment below the equator. Further monitoring and tracking of Chinook abundance, movement, distribution, and catches (both commercial and recreational) will be key components to making management decisions. Gathering more fisheries independent and dependent data will help give local people and managers get a better understanding of the nature of these introduced salmon and their effects on the local ecosystems. Going forward, defining the goals from the various stakeholders involved will be necessary to inform the best management decisions. A key challenge will be dealing with the tradeoffs associated with the economic benefits, such as the growing recreational salmon fishery that is starting to be known worldwide, as well as the ecological consequences and environmental costs of this new species. Hopefully, future management of this species, will allow for the species to be utilized beneficially (commercially and recreationally) while also minimizing negative impacts to marine commercial fisheries and the native ecosystems. The author with a female Steelhead (Oncorhynchus mykiss) from one of Humboldt County’s many rivers in fall 2018. My name is Alex Eaton and currently I am a student in the Fisheries Biology program at Humboldt State University. As an avid angler from a young age, I first became interested in fisheries through my grandfather who worked as a Fisheries Biologist for the Environmental Protection Agency for many years. As a kid, I was fortunate enough to go on seining and trawling trips on Leech Lake, MN where my grandfather lives. I am looking forward to being able to work with many different kinds of fishes in the future and throughout my life. I would especially like to work with salmonids from other regions (especially those endemic to Japan and Russia) and study how they differ from the salmonids we interact with every day in North America. These fishes interest me because I feel they are the least studied salmonids and being a citizen of Japan myself, I have seen the beauty and diversity that area holds. Arnason, R. 2001. Economics of ocean ranching: experiences, outlook and theory. Food and Agriculture Organization of the United Nations. Rome. Browning, R.J., 1980. Fisheries of the North Pacific, Revised edition. Alaska Northwest Publ., Anchorage. Castilla, J. C., M. Uribe, N. Bahamonde, M. Clarke, Desqueyroux-Faundez Ruth, I. Kong, H. Moyano, N. Rozbaczylo, Santelices Bernabé, C. Valdovinos, and P. Zavala. 2005. Down under the southeastern Pacific: marine non-indigenous species in Chile. Biological Invasions 7: 213–232. Correa, C. and M. R. Gross. 2008. Chinook salmon invade southern South America. Biological Invasions 10: 615-639. Correa, C. and P. Moran. 2017. Polyphyletic ancestry of expanding Patagonian Chinook salmon populations. Scientific Reports 7. Article number:14228. https://www.nature.com/articles/s41598-017-14465-y. Morrow, J.E., 1980. The freshwater fishes of Alaska. University of. B.C. Animal Resources Ecology Library. 248p. Soto, D., I. Arismendi, C. D. Prinzio, and F. Jara. 2007. Establishment of Chinook salmon (Oncorhynchus tshawytscha) in Pacific basins of southern South America and its potential ecosystem implications. Revista chilena de historia natural 80(1). Sepúlveda, F., Marın, S. L., and Carvajal, J. 2004. Metazoan parasites in wild fish and farmed salmon from aquaculture sites in southern Chile. Aquaculture, 235(1-4): 89-100. Previous Post Pet Fish or Alien Invader? Please do an honest report on the effects of Fukushima on Salmon and all Japanese commercial and sport fisheries, Corals, Squids, etc. What harmful effects could the non-indigenous Chinook Salmon have on South American Waters? Ocean, and fresh water (Spawning conflicts)? If they take hold, they can boost local economies and provide a new source for quality protein for the world.